TORONTO – At the turn of the millennium, there were four Canadian players in the NBA – a historic number at the time. Bill Wennington’s career was coming to an end just as Todd MacCulloch’s was beginning. Rick Fox was about to win his first of three consecutive championships with the Los Angeles Lakers. And then there was the great Steve Nash. Nash, a late bloomer by basketball standards, was just starting to come into his own with the Dallas Mavericks. He was still four years away from going back to Phoenix, the team that drafted him in 1996, and winning his first of two Most Valuable Player awards. He hadn’t made his first All-Star Game or even become a full-time starter yet, but he was blossoming into one of the league’s premiere young point guards. It was an exciting time to be a basketball fan in Canada. In Toronto, Vince Carter was quickly becoming one of the most popular athletes on the planet, and in doing so was putting the Raptors on the map. His iconic performance in the Slam Dunk Contest in Oakland that winter was a ‘Where were you when?’ moment. That summer, Nash wore the red and white at the Sydney Olympics. It was the first time the Canadian senior men’s national team had qualified for the Olympics in 12 years. They haven’t been back since. Born in Toronto just a few months earlier was RJ Barrett – son of Rowan Barrett, a teammate of Nash’s on the Olympic team, and godson of Nash. Fast-forward nearly two decades and the basketball landscape in Canada looks drastically different. We’re patiently waiting for the golden era that’s been promised, but it’s never felt closer. The rise of Canadian hoops continues to unfold before our eyes. When the 2018-19 NBA season opened in October, there were a record-setting 13 Canadians on rosters around the league, including players on two-way contracts. It’s the fifth straight year that Canada has produced the most NBA players of any country outside of the United States. Since 2011, Canada has produced 11 first-round draft picks, including eight lottery selections, and two first-overall picks. And there are plenty more Canadian prospects on the way. The 2019 NBA draft could include up to six Canadians, according to some early February mocks, which would shatter the country’s record of four selected players, set back in 2014 when Andrew Wiggins (Vaughan, Ont.) was taken with the top pick. 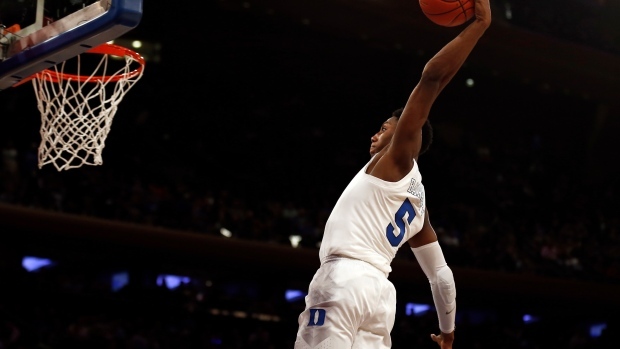 It’s headlined by Barrett – the Duke freshman and projected top-three pick, who many believe to be the future face of Canada Basketball. That’s a distinction that no one has held since Nash, now the general manager of the men’s national team. It’s not like the opportunity hasn’t been up for grabs. Those who once seemed worthy of carrying the torch and leading the next generation of Canadian talent have failed to live up to the lofty expectations or embrace the responsibility, or both. Anthony Bennett (Toronto), the first Canadian taken with the No. 1-overall pick in a NBA draft, became a cautionary tale. Wiggins, the country’s highest-rated prospect ever, hasn’t developed as many thought that he would or shown much interest in playing for the national team. But the future is bright. Many would argue that, even at 21, Denver Nuggets guard and Kitchener, Ont. native Jamal Murray has already surpassed Wiggins as the best Canadian in the NBA. He was a borderline all-star candidate this season and has the swagger, ability and seemingly the desire to help take the Canadian program to the next level. Hamilton, Ont.’s Shai Gilgeous-Alexander is also turning heads in his first NBA season with the Clippers. Then there’s Barrett, who may blossom into the best of all of them. The 18-year-old Mississauga, Ont. native was just named ACC Freshman of the Week for the third time this season. He’s scored more points through 20 games (471) than any Blue Devils freshman ever and is averaging an ACC-leading 23.1 points per contest. He’s also on pace for the highest scoring average by a freshman in ACC history, according to ESPN Stats and Info. He’s dynamic, he’s versatile, and for those wondering what separates him from Wiggins, his motor is always running. Whether he’s up against high school kids with a fraction of his natural talent, facing the Chinese national team in an exhibition game over the summer or playing under the bright lights at Duke, you can count on him getting after it. His Blue Devils teammate, phenom Zion Williamson, is making a strong case to go first-overall in next summer’s draft – a spot that once seemed earmarked for the Canadian – but regardless of when Barrett hears his named called, his maturity and basketball DNA should ensure a smooth transition to the pros. Barrett’s draft class could also include Virginia Tech guard Nickeil Alexander-Walker (Toronto) – a cousin of Gilgeous-Alexander – Gonzaga forward Brandon Clarke (Vancouver), Michigan forward Ignas Brazdeikis (Oakville, Ont. ), Arizona St. guard Luguentz Dort (Montreal) and Vanderbilt forward Simi Shittu (Burlington, Ont.). There are many more Canadians playing Division I basketball and coming up the pipeline behind them. The country is churning out top-tier talent at a historic rate, particularly in the Greater Toronto area, which has become a hotbed for hoops. A story written by Michael A. Fletcher for The Undefeated in 2017 cites a report by Solutions Research Group (SRG) in Canada that lists basketball as the second-most popular sport among the country’s millennials, trailing hockey. It also references a 2014 Canadian Youth Sports Report that found basketball had the second-highest participation for team sports among children between the ages of three and 17, behind soccer but ahead of hockey. How did this happen? To what do we owe the sport’s growing popularity north of the border? Nash’s influence was very real. He wasn’t a freak athletic specimen. He didn’t look like a two-time MVP and he certainly wasn’t supposed to be one. His self-made Canadian success story was like nothing we had ever seen before. He inspired and proved that it was possible. Carter’s impact was just as significant and arguably bigger, albeit very different. He wasn’t Canadian and he definitely wasn’t the everyman. He could do things on the court that most could only dream of. His tenure in Toronto was brief and ended in heartbreak for fans across the nation, but there’s no denying he made kids want to pick up a basketball. However, merely crediting Nash or Carter for the Canadian basketball boom would be a disservice to the country, its many development programs, its coaches and the players themselves. Barrett was still in the womb when Carter had his coming-out party at All-Star Weekend in Oakland. Gilgeous-Alexander hadn’t even turned three at the height of Carter’s run in Toronto. He grew up watching Chris Bosh, T.J. Ford and Jose Calderon at the Air Canada Centre. The players coming up now don’t know a time before the NBA existed in Canada. They were just as likely to be inspired by players like Cory Joseph (Pickering, Ont. ), Tristan Thompson (Brampton, Ont.) or Kelly Olynyk (Kamloops, B.C. ), who have all been in the league for the better part of the last decade. It’s cyclical, meaning the sport should only continue to grow as its infrastructure does. More and more, AAU programs like Grassroots Elite and CIA Bounce are helping prepare the country’s young players to reach the next level. Canada has also produced elite talent on the sidelines, with coaching success stories like Jay Triano (Niagara Falls, Ont.) – the former Raptors head coach and current Charlotte Hornets assistant, who’s also the head coach of the Canadian national team – Boston Celtics assistant Scott Morrison (Prince Edward Island), Raptors 905 head coach Jama Mahlalela (North York, Ont. ), Ryerson University’s Roy Rana (Toronto), Carleton University’s Dave Smart (Kingston, Ont. ), and many more. Meanwhile, Canada Basketball still has a long way to go but it is trending in the right direction. The organization’s recent hiring of former Raptors general manager and long-time NBA executive Glen Grunwald as president and CEO was a slam dunk. Most of the heavy lifting will come on the business side, where the program’s primary challenge remains fundraising. On the court, the women are ahead of the men. They’re ranked fifth in the world and have finished in the top eight at the last two Olympics. The senior men just qualified for next summer’s FIBA World Cup in China, where – after several missed opportunities in past years – they’ll look to punch their ticket to the Olympics for the first time since Nash represented them in 2000. Making it through these recent qualifiers despite FIBA’s new year-round format that prevents NBA players from suiting up during crucial windows speaks to the depth of the program. Still, their success next summer and beyond is contingent on the commitment of their best players. It’s not realistic to expect everybody to be available. There are simply too many variables when it comes to an individual player’s decision to participate in international competition any given summer: health, contract status, personal obligations, and team commitments, among others. That’s another benefit of Canada’s newfound depth. However, their strength – relative to every other country outside of the U.S. – is the high-end NBA talent they could feature. Many of Canada’s NBA players have already expressed interest in making the trip to China next summer. Depending on the turnout, they may have finally reached the point where they’ll be forced to cut one of them in order to trim down the roster. That’s a good problem to have and something Triano has been anticipating for years. Will Barrett be able to participate just a month before the start of his first NBA season? That remains to be seen. Most rookies opt to focus on getting acclimated to their new club. Whether he’s able to get clearance from whichever team drafts him or not, rest assured, Barrett is expected to be a big part of the program’s future. That he grew up around it and his father is currently the executive VP and assistant GM certainly doesn’t hurt. Some have already ticketed this as the golden age of Canadian hoops, but they’re only just scratching the surface. It’s not here yet, but there’s reason to believe it’s not far away either. With all the talent that is coming out of the country – players that aren’t just skilled, but also seem eager to wear the flag with pride – it’s only a matter of time before Canada is making noise on the world stage.